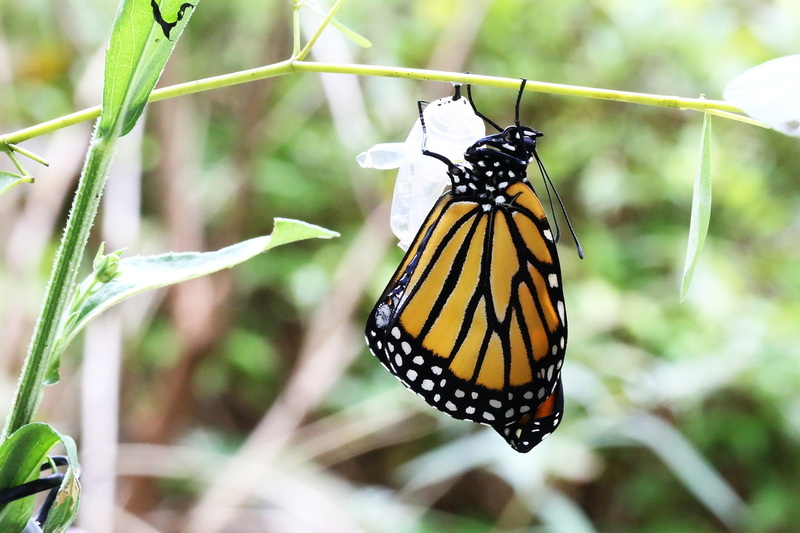 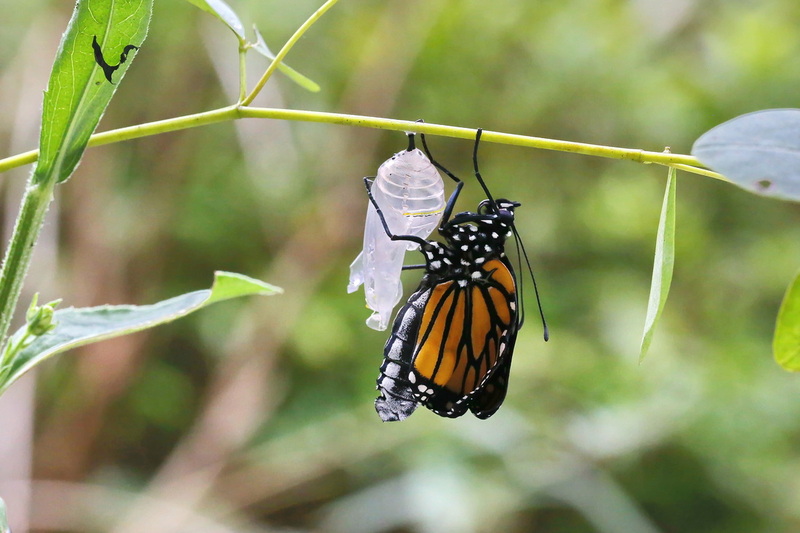 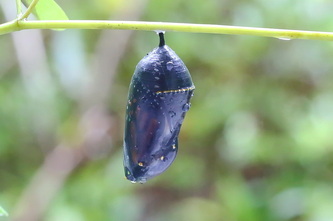 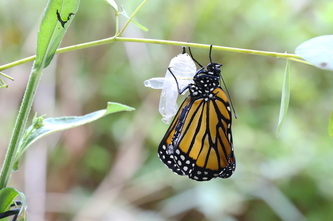 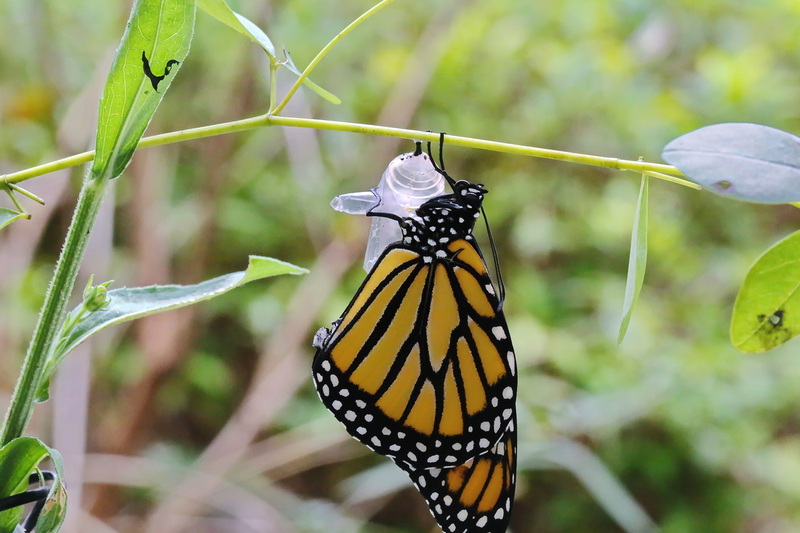 This page presents a series of photographs depicting the life cycle of the Monarch butterfly (Danaus plexippus), from egg to caterpillar to chrysalis to butterfly and again to egg. The Monarch is identified by orange and black wings in a distinctive pattern, with a wingspan of 3½–4 inches. 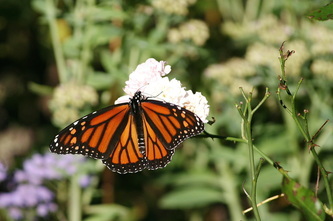 Female monarchs have darker veins on their wings, and males have a dark spot in the center of each hind wing. 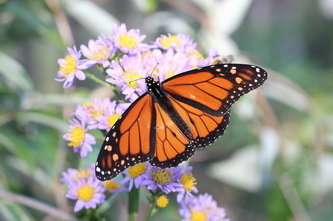 The Monarch is famous for its round-trip migration south during late summer and fall from the United States and southern Canada to Mexico and coastal California, and then the northward return in spring. 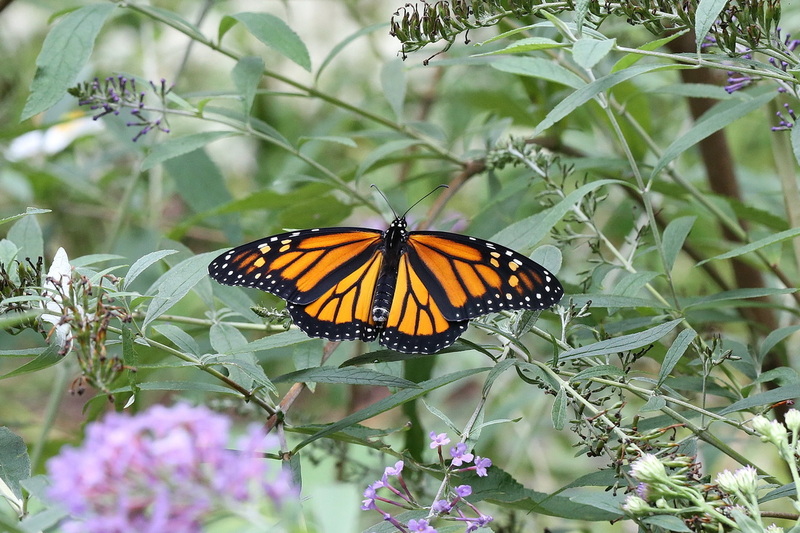 The Monarch is the only North American butterfly that migrates both north and south as birds do regularly. 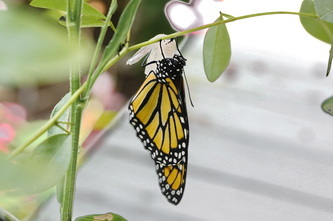 No single individual butterfly can make the entire round trip; rather three to four generations are required. 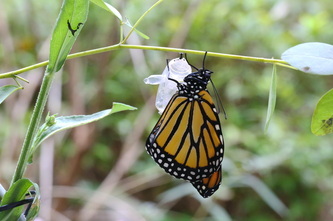 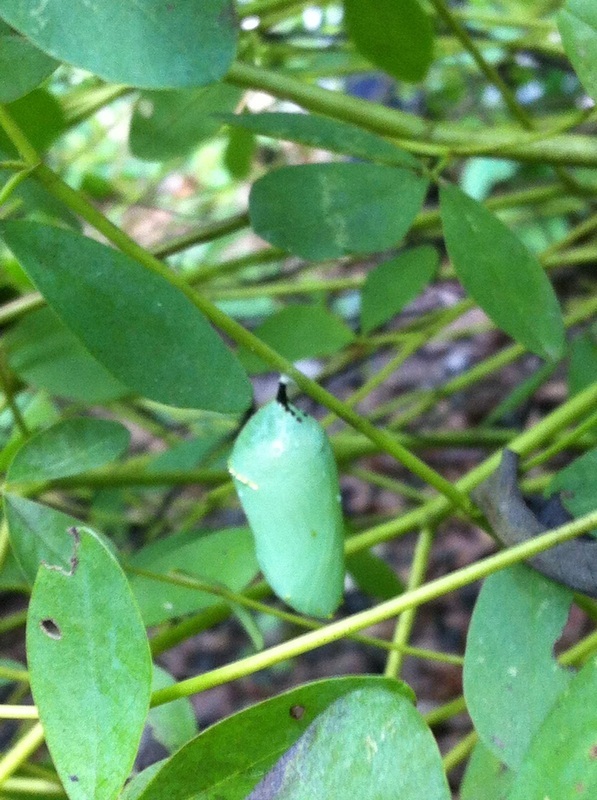 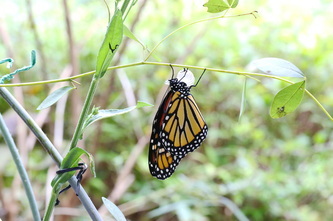 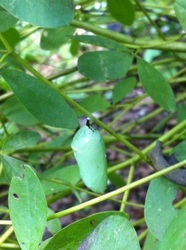 The life cycle of a Monarch begins with the females laying eggs on the stems of milkweed plants, the leaves of which are the only thing the Monarch caterpillars eat. 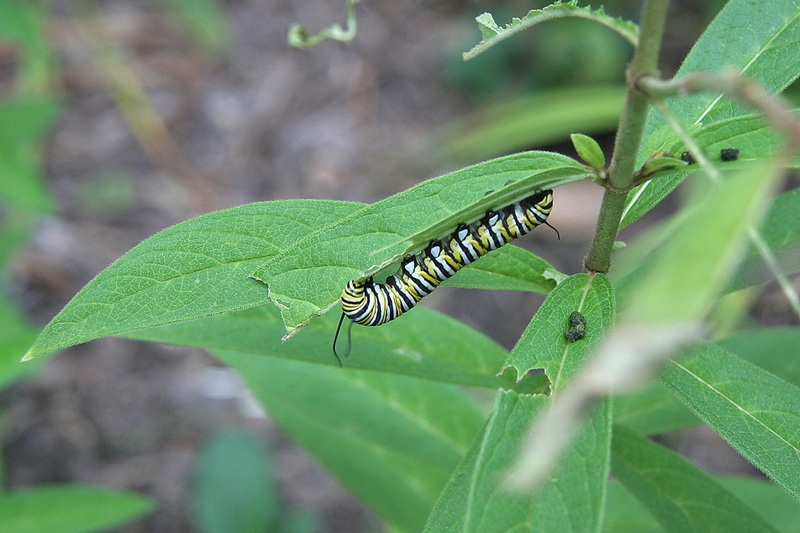 Milkweed leaves contain a chemical that renders the butterfly distasteful or even poisonous to birds and other predators. The multiple generations involved in the Monarch migration share only the northbound half of the trip. 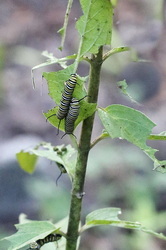 In the case of the Monarch population east of the Rocky Mountains. the trip north begins in Mexico in early spring and, after several generations, ends in breeding grounds in the US and southern Canada. 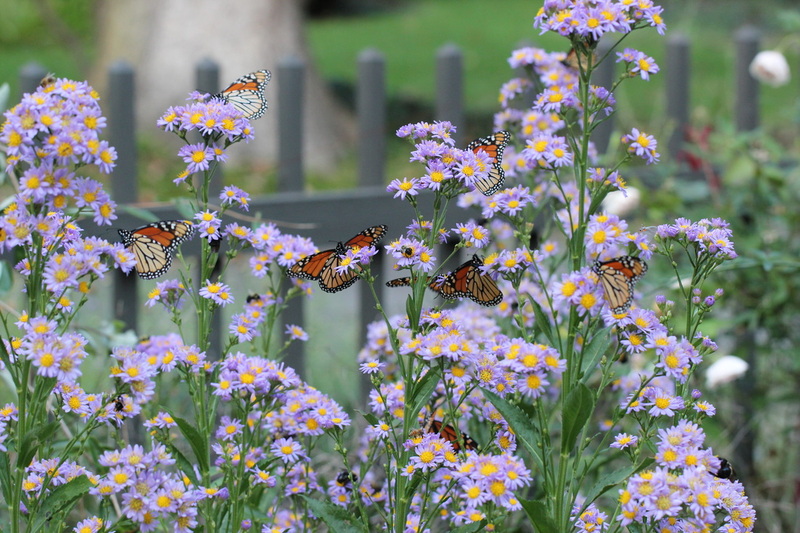 The southbound return to Mexico in the fall is made by one generation, each butterfly making the entire southbound trip. 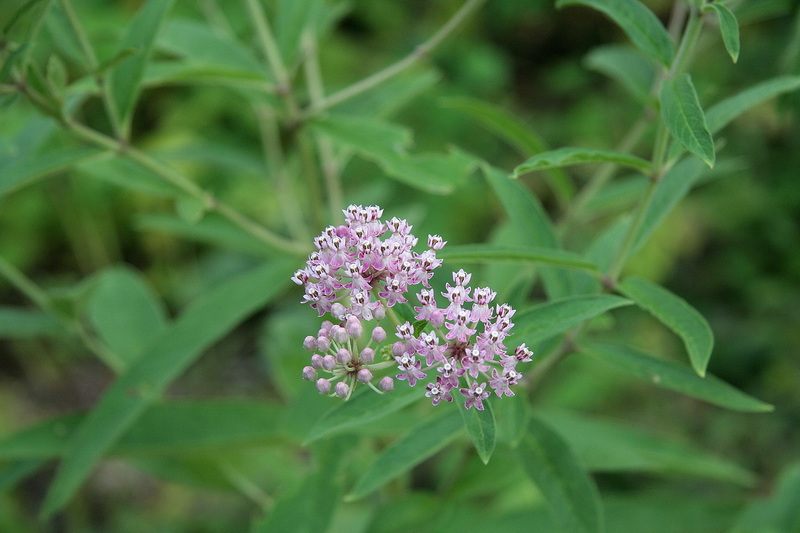 After overwintering in Mexico, this same generation that came south heads north in early spring to the first milkweed plants that they can find, typically in southern Texas. 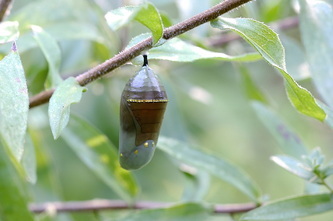 The females then breed and lay eggs, which, after metamorphosis into butterflies, continue the migration north. Each generation of northbound butterflies lives only 2-3 weeks, at the end of which the females lay the eggs that become the next generation. How the species manages to return each year to the same overwintering spots over a span of several generations is still a subject of research. 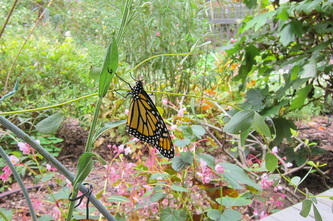 (For more information on the Monarch, see Wikipedia, from which much of the above came). 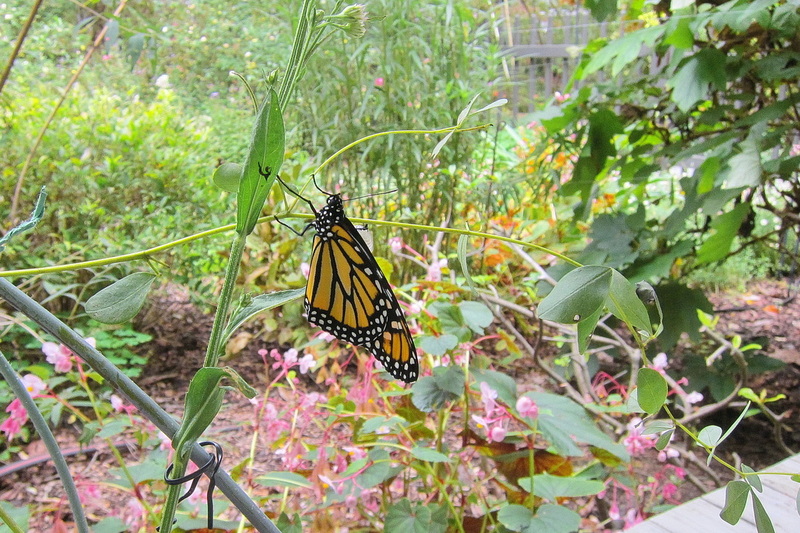 The Monarch life cycle is shown in the series of photographs below, all of which were taken in our garden in Chapel Hill.